Life is too short to drink bad beer. Fortunately, there are several breweries in Toronto that have dedicated themselves to the art of crafting the perfect pint of suds. The craft beer scene in Toronto is thriving and these creative and hardworking brewers really take their beers seriously. Here are some of Toronto’s best breweries to sample some of the delicious local brews. This is the oldest craft brewery in Toronto – it was established as a brew pub way back in 1986. Sit back in one of the comfortable Adirondack chairs and sip on the Barrel Aged Double Tempest, the Boneshaker IPA or the 3 Speed Session Lager. The food menu is also pretty great and pairs well with the beer, with yummy snacks such as mac & cheese croquettes, Amsterdam pretzels and sweet potato fries. them a try? They are a beer based spirit distilled in the only copper pot still in North America. This family owned brewery is a local favourite and they have been around for over two decades. They make English style ales in small batches and they have won a lot of awards for their creations. Their cask ale Hopping Mad has been highly acclaimed at the Golden Tap Awards for the past three years. Steam Whistle are gold medal winners at the Canadian Brewing awards and once you taste their delicious ales you will understand why. They have a sampling bar where you can take free sips of all of the different types of beers and find your favourite. You can also take a 30-minute tour of the facilities to see how the beer is made, then finish the tour with a cold bottle. Not only does this cool hangout have excellent craft beers, it also has pinball machines, retro 80s style arcade games and a very chilled out vibe. If you like Pale Ale, try the hoppy Pineball Wizard. Or, check out their currently nano-brew, which is always changing. These are just a few of Toronto’s best breweries to start a local crawl of Toronto. And why not check out some of our picks for restaurants for groups! Enjoy responsibly and have fun! 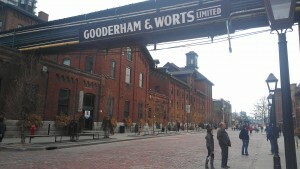 The Distillery District, a national historic site in Toronto, is a neighbourhood and village of its own, a distinctly unique area in the city, just east of Old Town (King East) and south of Corktown. It’s a great mini-escape from the hustle of downtown Toronto and outside of our downtown properties while still being in the downtown area. Though it’s much quieter during the weekdays instead of the weekends, it’s a lovely way to explore more of the city, get connected to its roots, and escape the hustle of downtown. Here are our favourite places and events to explore the Distillery District. As one of our top patio picks in Toronto, El Catrin’s bright outdoor display is one you can’t miss in The Distillery. Sun yourself alongside a margarita amongst the bright yellow lamps on the heated patio or stay awhile under the large scale murals and comfy benches inside over Mexican inspired fare. It’s our pick for a date in the area. SOMA has been known as the best chocolate maker in the city and it’s a treat to visit its original location in the distillery (just past El Catrin). Taste test a truffle (or ten), savour the gelato, or sip on SOMA’s famous drinking chocolate on the back wooden stairs. At this location, you can also watch the chocolate-making process through the glass windows. Of course, this is one of the best places to get a “Made in Toronto” gift. Closer to our downtown locations is SOMA’s second King Street location. 3. 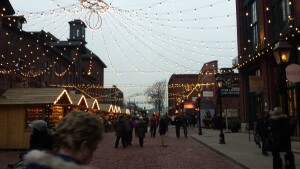 Events Year round, The Distillery District provides ambiance with its open area in the main square for performances among its cobblestones and unmarked green doors. Stroll for fresh produce and other made in Ontario products at the Sunday Summer Market; Lounge in the main square during the numerous festivals like the TD Jazz Fest; Art Fest is a more unique festival in September; and the most famous event–rounding out the end of the year– is the Toronto Christmas Market, ideal to find unique gifts and warm up under the fire with some mulled wine. 4. Pikto When is the last time you p rinted a photo? Professional services still exist and Pikto is the place where photography enthusiasts and the pros get their prints and photobooks done. Peruse the photobooks, sign up or inquire about a photography workshop, or even print your instagram photos. 5. Soulpepper Theatre Though the Distillery is known for its art galleries, tucked in the back of the district on the east side, you’ll find this treasure trove of a theatre. Watch a new play or check out their concert series when in season. The theatre is a strong supporter of youth and has many free programs and initiatives in this area (great for your child who has a creative or dramatic streak). There are so many other reasons to visit the Distillery District. 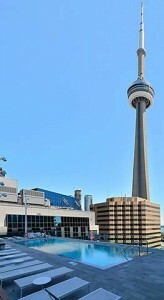 Not too far from your furnished suite in Toronto, we hope that you check out the Distillery when you are in Toronto. 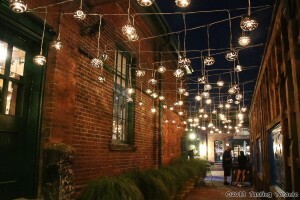 What is your favourite thing in or about the Distillery District? Toronto is the financial center of Canada and as a result, has many hubs for companies in banking, technology, consulting and real estate. 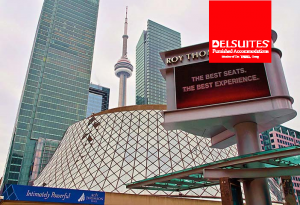 If you’re considering sending your employees to work in Toronto –consider DelSuites for accommodation options. Here are a few reasons why DelSuites can make a difference for your employees and why you should consider Toronto Executive Rentals. 1. Cheaper than a Hotel. The average cost of a hotel room in Toronto is about $150 per night. 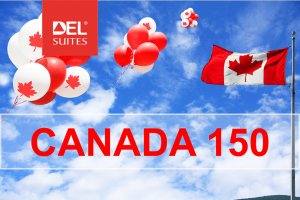 The average cost for a fully furnished suite via DelSuites is about $125-$130 per night for a 1-bedroom suite (Prices and inflation are subject to change). The cost of a hotel downtown close to the financial center only increases where the price at DelSuites stays relatively the same. Many costs at a hotel are extra. Unlike a hotel, we have taken care of all of the costs for you. No surprises. Our rates include wireless internet, cable, housekeeping and parking (at most suburb locations). Our suites also have en-suite laundry unlike many hotels, where there is no laundry and dry cleaning would be extra. All of our properties are located near or in the city centres, which will make it convenient for your employees to adapt to their new area. Our properties are also located near main subway and Go Transit lines to make it easy for your employees to commute from the office to home. The majority of our properties are equipped with amazing facilities such as fitness centers and swimming pools so your employees don’t have to worry about finding a fitness center during their stay in the Greater Toronto Area. Our properties are also located near great restaurants and shops should your employees and our guests find they want to explore their surrounding area after work. We have listed our favourite places here on our blog as an added value to our guests. All you have to do is enter the keyword of your city in the search box to find what you’re looking for. 4. A Temporary Home Away From Home. 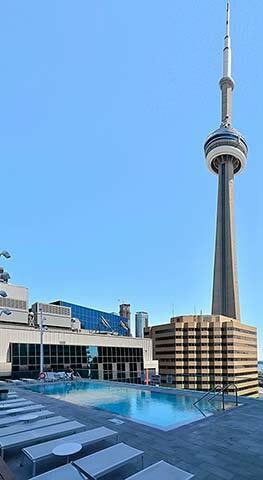 All of the little things that many people have to worry about when relocating or moving to a new city like Toronto are taken care of for you through DelSuites. Your employees walk into a fully furnished modern apartment, complete with a welcome bag containing a start up supply of snack s, laundry and dish detergent, etc. In addition, a fully stocked kitchen, ensuite laundry, free wifi, cable TV in both the living room and bedroom. To help settle in, there is a Pre-Arrival Grocery Service available for an extra cost. We will even pick up your employee from the airport and drive them in comfort directly to their building with our airport transportation services. All of our rentals include taxes. There are no added charges, which makes budgeting easier for your company or HR Department when considering to relocate an employee. 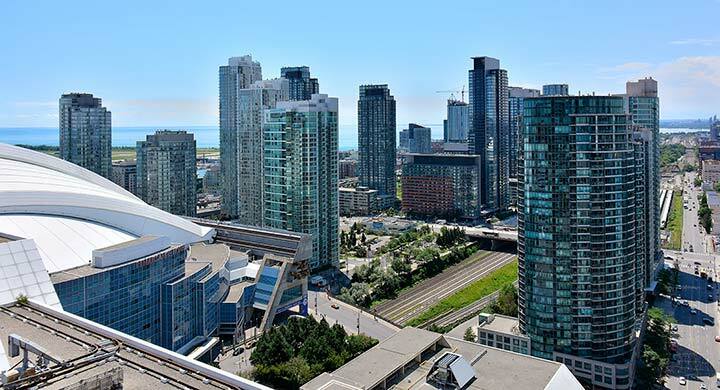 If you are considering sending your employees to Toronto for a project, assignment or relocation, feel free to get in contact with us should Toronto executive rentals be required. We look forward to hearing from you. 1. No worries. 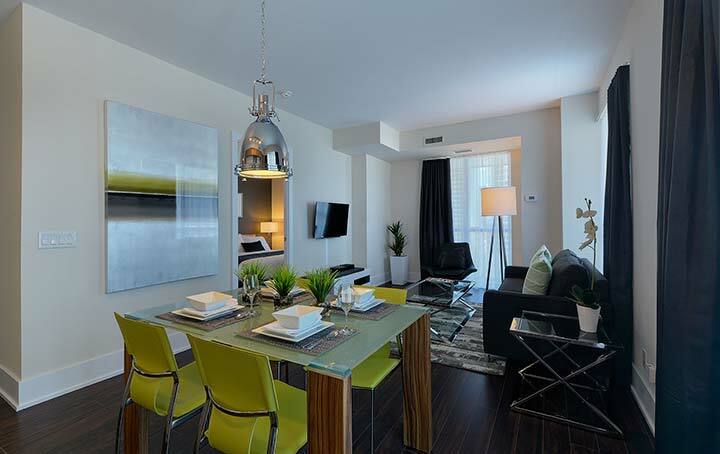 Having a furnished rental means you are relieved of the worries associated with furnishing. No moving. No worrying about decor or dimensions. No moving costs or having to figure out who will help you move. From airport pick up and drop off to taking care of your family needs, Delsuites makes you feel at home, stress free! 3. Housekeeping included. One of the big advantages of living in a furnished condo is that if you are busy and on the go, whether you’re an executive or traveling for leisure, is our housekeeping services. Once a week, at a scheduled time, your apartment will be cleaned and tidy. Another bonus is that you don’t have to do your laundry anywhere either. It’s ensuite! 4. Ease of Meeting Neighbours. Since you are located in a property with various amenities like a fitness centre, outdoor deck and swimming pool, or party/billiards room, it is quite easy to encounter and befriend your neighbours. Many of our clients may be in similar situations such as relocation or displacement so it will be easier to bond over these shared situations. 5. All Inclusive Rates. Delsuites has all-inclusive rates so you’ll also get other amenities included in your rental including 24/hour security, an exercise/party room, and with many properties, an outdoor pool or lounge (not to mention being located in central and accessible locations, as per our above points). 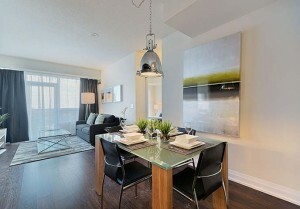 Do you like living in a furnished condo, or rental? Why?